AlalODulal Editorial Board condemns in the strongest terms the violence that left at least 11 Urdu Speaking people (“Biharis”) dead. Anthropologist Dina Siddiqi’s research on the conditions of “stranded Pakistanis” (inaccurately called “Biharis,” but more accurately “Urdu speakers”) after 1971 is newly relevant. In the current discourse around the 1971 war, the fate of the Urdu speakers at war’s end is elided. It is one of the zones of silence because it does not fit with the Bangladeshi discourse around the war. Nor does it fit Pakistan’s convenient discourse, especially after a 2008 high court decision granted them Bangladeshi citizenship. We at AlalODulal feel it is crucial to highlight those left behind in multiple nation projects. … If the borders of Pakistan were theoretically open to all Muslims in 1947, the conditions for citizenship changed considerably by 1971. In the intervening years, the very idea of Pakistan had unraveled in East Pakistan; Bengalis of all classes found themselves culturally and economically marginalized by non-Bengalis. The latter were primarily bureaucrats, industrialists and military personnel, often Punjabi rather than Urdu speakers. Within five years of Pakistan’s emergence, language became a major site of political and cultural contestation between East and West Pakistan. By the 1960s calls for greater regional autonomy and more equitable resource distribution came to be squarely situated within a movement for Bengali linguistic and cultural autonomy. The cultural parameters of this political struggle rendered Urdu speakers in East Pakistan the Other in ‘their own land,’ at least in the eyes of the Bengali-speaking majority. The latter saw non-Bengali migrants as a privileged comprador class. The production of a monolithic non-Bengali Cultural Other in the Bengali imaginary left little space for distinctions among ‘Urdu speakers,’ the most powerful of whom were ethnically Punjabi. Given their structural position, it is no surprise that Biharis did not readily empathize with the aspirations of the emergent Bengali bourgeoisie. The open collaboration of some Urdu-speakers with the Pakistani army in the latter’s brutal suppression of and genocidal war on Bengalis in 1971 rendered all ‘Biharis’ into permanent national pariahs. Biharis came to be inextricably linked in national memory with Pakistani army brutality. The extent to which the former were involved in al Badr and al Shams remains a matter of dispute. Leaders of the ‘stranded Pakistanis’ vehemently deny any involvement; they point out that the army recruited Urdu-speakers to a separate force, the East Pakistan Civil Armed Forces (EPCAF) which was posted mainly in border regions, tasked with policing national borders. Few Bengalis have ever heard of EPCAF. Razakar, however, is a household word denoting wartime collaboration and generalized treachery. As a sovereign state with a dominant Muslim population, Bangladesh in 1971 faced the double burden of distinguishing itself from both Bengalis in neighboring India and from Muslims in Pakistan. No wonder the relation between the terms Bengali, Muslim and Hindu has preoccupied the historiography of the territory that is now Bangladesh. Contentious discussions on the constitution of the Bengali/Bangladeshi nation still hold center stage in nationalist discourse (ibid). Such discussions, centered on the putative opposition of Bengali/Muslim and the conflation of Hindu/Bengali, exclude many groups whose histories are tied into the making of Bangladesh. The active forgetting of the fractious histories of partition renders the historiography of Bangladesh slightly askew of the rest of the subcontinent, at least in relation to the recalling of partition. In India and Pakistan, dominant historical narratives culminate in the story of ‘Freedom at Midnight’ in 1947. This celebration of 1947 is notably absent in Bangladesh. In the weeks leading up to the 50th anniversary of Indian and Pakistani Independence, BBC World and CNN International, both cable channels available to Bangladeshi audiences, devoted extensive coverage to related events. In contrast, Bangladeshi newspapers and other media exhibited a muted interest in the anniversary or ignored it altogether. That the 1947 partition/Independence appears to have become a non-event in a state that was once part of Pakistan is a feature of Bangladeshi historiography worth revisiting…. It is instructive to trace the points of intersection and disjunction between personal and official narratives of the nation. Javed Hasan (a pseudonym) was born in Bihar in 1944. He is a resident of a camp in Khulna, although he spends most of his time in Dhaka. He says he has no profession or employment, his profession is to protest or demonstrate (andolon kora). He obviously has no recollection of the partition but has heard stories from his father and other senior males in the family, and no doubt from SPGRC leaders. Javed Hasan’s sense of belonging to (East) Pakistan is not as strong as one might have expected. Hasan has grown up with nostalgia for a life left behind in India where, according to him, Urdu speakers/Biharis had social standing and clout. He returns to this topic later in his account. As he represents it, the decision to migrate to East Bengal/East Pakistan – a land of ‘only swamps and canals’ – was more of a compulsion than a choice for his father. Coming to the East was a sacrifice that Muslims were called on to make, to help build the new nation. The theme of sacrifice is central to his construction of community and national identity…. Many people died in the riots of Bihar. Of those who survived, many went to East or West Pakistan. Our car [railway carriage] was going towards Punjab but there was so much killing and violence — the Sikhs were stopping trains to murder the passengers. So the government turned the train around and made us return to Calcutta, then pushed us into East Pakistan. The Sikhs, you know, have done very well for themselves, I mean politically, in the Punjab. Quaid-e-Azam [Jinnah] tried at one time to avoid the division of Punjab — he urged the Sikhs to stay, promised their leaders they would have full rights but Nehru and Gandhi lured them away with talk of religion and what not. Got them all riled up. Some Muslims were killed. The record has underestimated the numbers killed in all. I would say around 60 lakhs (6 million) died. The most deaths were in Bihar.Without the deaths, Pakistan could not have been created. The passage above is notable for several reasons. Here Sikhs, rather than Hindus are invoked as the Other. In a reversal of ‘commonsense’ partition narratives, Nehru and Gandhi are held responsible for the division of the Punjab and for instigating communal violence. Most striking, for Javed Hasan the sacrifice of Muslim blood is fundamental to the emergence of Pakistan. (Notably, Muslims in Bihar are situated at the forefront of this sacrifice). The statement that Pakistan could not have been created without the deaths of Muslims forces a recalibration of the meaning of communal violence during partition. What could be seen as senseless horror and loss is here transposed into meaningful sacrifice for the future. (This resonates with the idea of the ‘first’ independence noted earlier). Javed Hasan goes on to reflect on post-partition life in India for the Muslim minority. Curiously, India is here represented as a place where Muslims still hold sway, in implicit comparison to Muslim majority Bangladesh. I lived in Saidpur until 1974, when I moved to Khulna. There I’m a leader of the party [SPGRC], which has a wing in Khulna. I have to stay in Dhaka most of the time since all the embassies, political parties, NGOs and journalists are based here. Clearly the speaker feels a strong sense of identity with Muslims across India, not just Bihar, as evinced by his use of the pronoun ‘we’. The slippage between Biharis and Muslims, between Urdu speaking Muslims in Bangladesh and Muslims in India, and between an imagined Muslim community and the glories of its cultural heritage in the golden age of Muslims (the Pakistani singer Nurjahan, Moghul era Red Fort, and the British established Aligarh University), are instructive. By implication, neither Bangladesh, nor Bengali speaking Muslims, fall within his definition of Muslim community. The location of Pakistan and the meaning of East Pakistan after 1971 shift in his narrative accordingly. I’ve never been to Pakistan, nor has my father. I haven’t been to Bihar in 50 years although we still have a share in the land. It’s only since we came here that we’ve been divided. In Pakistan, we are called Muhajir. Here, we have been given 4 names — refugee, non-Bengali, Bihari and Stranded Pakistanis. Bhutto was only interested in taking back the Punjabis, he knew he needed Punjabi support to remain Pakistan’s President. For someone born in 1944, to claim that neither he nor his father had ever been to Pakistan says something very specific about the shifting meaning and territoriality of Pakistan. Javed Hasan’s time in what was East Pakistan between 1947 and 1971 no longer counts as ever having been in Pakistan. It is as though the emergence of Bangladesh erases its past meaning as East Pakistan (a line of thinking that is consistent with Bengalis nationalist ideology, it should be noted). At the same time, when Javed Hasan speaks of Bengalis, implicitly he equates them with Hindus, echoing older colonial and Hindu nationalist discourse. So below, when he talks about ‘we Muslims’ no longer being safe, he clearly does not include Bengali speaking Muslims. He reconstitutes the putative opposition between Muslim and Bengali, constructing boundaries around Muslim identity that are given content elsewhere, outside the territory that is now Bangladesh. Paradoxically, for Urdu-speakers to regain rights to the nation, they needed to embrace the identity of the refugee, the stigma of which the bhadralok sought to cast off. Bengalis are always telling us to become Bengali but what does it take? I mean, here I am talking to you in Bangla. Tell me the kalma [formal declaration of faith for Muslims/here something like a magic charm] that will make me Bengali, so I will no longer be called a Pakistani, Bihari or a refugee. Bangladesh’s sovereignty created a permanent rupture in identity – a civil death – for Urdu speakers in East Pakistan. Those who had previously mediated belonging and citizenship through the idiom of sacrifice to the Muslim nation found themselves excluded by the terms through which the Pakistani nation was redefined in 1971. Urdu speakers became the new Bengali state’s enemy Other, at the moment the Pakistan they knew quite literally ceased to exist under their feet. The nation left them, even though they were still on the same soil. They could not follow. This paradoxical condition was rooted in the shifting relationships between national and territorial identities generated by partition. Ambivalence and tensions around partition were not only productive of identities; on occasion they erased claims to belonging altogether. For those in danger of permanent civil death, recourse to the idiom of sacrifice no longer sufficed. 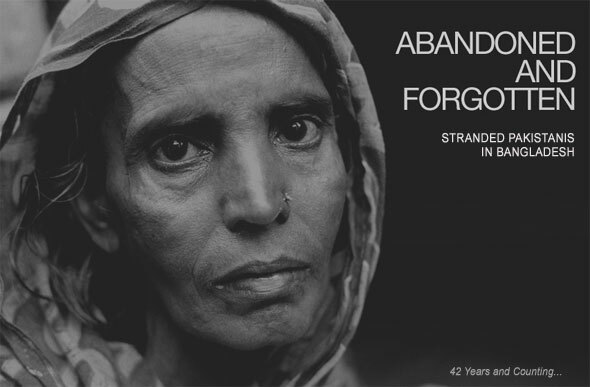 Both refugee and citizen at the moment of partition, Urdu speakers in East Pakistan were rendered non-citizens and non-refugees in independent Bangladesh…. Willem van Schendel has long advocated the writing of post-nationalist histories of Bangladesh, histories that go beyond “getting Bengali nationalism right.” (Van Schendel 2001: 134). Noting that contemporary political disputes in Bangladesh are fundamentally conflicted about what constitutes the common history and common destiny of the inhabitants of the country, van Schendel reminds us that the study of history is always a study in power relations and that debates over the definitions of Bengali/Muslim/Hindu obscure underlying bids for power. Van Schendel argues for a “pluralist” critique of national narratives, one that would confront the exclusionary and inegalitarian aspects of such narratives as they have developed since 1971. Such a project could help in defining “new, more pluralistic, inclusive and democratic notions of what it could mean to be Bangladeshi citizen in the twenty-first century” (Van Schendel 2001: 134)…. A difficult and well-presented article on an issue I quite honestly hadn’t thought about before. It always surprises me that we were able to give a car and national flag to Sayidee, SaQa Chow etc but not able to find a solution to these helpless souls. This is such a shame to all countries concerned, our own flesh and blood that suffer as being stateless people. I am a little surprised that there is no mention of the post-Liberation War retaliation of Bangladeshis on the ‘biharis’. I think the fact that we tend to ignore and not allow it to surface is one way we have kept on saying that mistreating “them” is acceptable. Perhaps the dehumanisation inherent in the stranded pakistani label is problematic too. I hope and pray that the communities sharpen their voice and mobilisations because if they can get burned on Shababarat, and countless other victims of the state putrefy in undisclosed locations, who knows whats in store for them in the weeks and years to come.